Most people these days would opt for a less-invasive option in any surgical procedure, if one is available. Who wouldn't want quicker recovery time, less inconvenience and reduced pain? 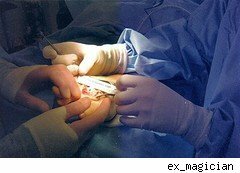 But a new study recently revealed that such surgery entails risks as well as benefits. Specifically, a report published in the Journal of the American Medical Association on Oct. 13 found that despite the assumption that a minimally invasive prostate cancer surgery would yield better results, the evidence showed it increased the risk of losing sexual function and urine control. There were some benefits. The study found that men who had a less-invasive surgery indeed spent less time in the hospital and had fewer respiratory and miscellaneous surgical complications. Regarding the cancer treatment itself, they had similar postoperative use of additional cancer therapies. However, they were more likely to be incontinent (lose urine control) and have erectile dysfunction than men who had conventional, open surgery. After adjusting for different factors, the researchers found that incontinence after surgery was 30 percent more likely in the less-invasive surgery, and impotence 40 percent more likely. Developing technologies for less-invasive surgeries and exams has been very lucrative for many companies. The prostate cancer operation is often robotically assisted with the help of the heavily marketed da Vinci system, made by Intuitive Surgical Inc. (ISRG) in Sunnyvale, Calif.
Interestingly, despite limited data on outcomes and costs compared with open surgery, minimally invasive surgery has become very popular, with 43 percent of patients opting for it by 2007. Hospitals advertise the systems as being able to reduce trauma, blood loss, risk of infection, scarring and often pain. The problem is that while the study found benefits associated with the robotic-assisted surgery, they weren't necessarily the ones advertised. Drugs must go through rigorous testing, and in the third phase of clinical trials they have to be compared to current standard treatment to show similar or superior efficacy. However, according to the lead researcher, few studies have so far compared the efficacy of minimally invasive surgery with open surgery. The FDA, of course, has approved the da Vinci system for several surgeries, including radical prostatectomy. The researchers, led by Jim Hu, a urologist at Harvard Medical School and Brigham & Women's Hospital in Boston (the Defense Department funded the work), used patient data from a cancer registry and linked it to the Medicare billing system for the elderly on procedures done from 2003 to 2007. In total, 1,938 men underwent robotic surgery, and 6,899 had open surgery. During those years, the use of minimally invasive surgery for prostate cancer increased fivefold. Surgery is never a simple matter. In the open version of a radical prostatectomy, a large abdominal incision is made. In the robotic-assisted surgery, smaller cuts are made, and the surgeon moves a robotic arm equipped with tools while sitting at a computer console near the operating table. Nerves, arteries and veins surround the prostate, and are responsible for different functions such as sphincter control and erection. The prostate has to be removed without damaging them. The less-invasive surgery had become a lifestyle choice for more affluent and educated men. Also, fewer black and Hispanic men in the study had the minimally invasive surgery, while Asians were much more likely to get it. These differences were evident in the study, creating limitations that Intuitive Surgical quickly pointed out. Other sticking points included the use of the registry and Medicare billing data, in which men 65 and older were chosen. Ideally, patients should have been randomly assigned a procedure. Moreover, the data used didn't indicate whether the da Vinci system was the one used in the minimally invasive surgery, although most such surgeries use the system. Intuitive Surgical disputes the findings, saying that over 800 papers were published in peer-reviewed journals regarding the outcomes of radical prostatectomy, with the majority of them favorable. It cites several of them on its website. Dr. Hu told DailyFinance that "Intuitive has doctors that they pay to do research that makes their product look favorable." He added that in his study, the " findings do not have observer bias." Some doctors think surgeons' inexperience led to the study results. The company hasn't immediately responded to a request for comment. ISRG shares fell from $254 to $250 when the study results first were published on Oct. 13, but rebounded the following day to $257. Perhaps investors assume that Americans will continue to opt for the less-invasive option and that, with time, doctors will improve their expertise, if that is indeed a main cause for the findings.